As 2016 draws to a close (thank God! ), instead of dwelling on all the awful events of the past 365 days, I’m searching for new ways to ignite my creative passion, find joy in side projects, and create abundance through my abilities. Sounds lofty right? Well, it really all goes back to my Pratt MFA thesis I recently blogged about after the election. So what does this have to do with Oklahoma!? Over the weekend, I stumbled across on Instagram post from the Ace Hotel of a page from Agnes de Mille’s biography of Martha Graham. For those who don’t know, Martha Graham was a LEGENDARY dancer and choreographer who’s artistry is compared to that of Frank Lloyd Wright and Picasso for her contribution to the arts. In the passage, Agnes de Mille had recently found wild success for her work for Oklahoma!, a new musical that became an overnight success. But de Mille wasn’t satisfied as she felt like she’d done better work before that never reached the same success or acclaim. Amazing right?? The Instagram post (below) literally stopped me in my tracks. I struggle constantly with a feeling of not being “good enough,” or not having an idea that’s original enough. So much so that I typically don’t start anything at all. I’m the one blocking my “channel” .. the only thing (or person) standing in my way is me! So that’s the plan for 2017, to keep my channel open. Create abundance with my abilities, and return to a state of joy through exploration, making and sharing my work. I hope you’ll join me on my journey! 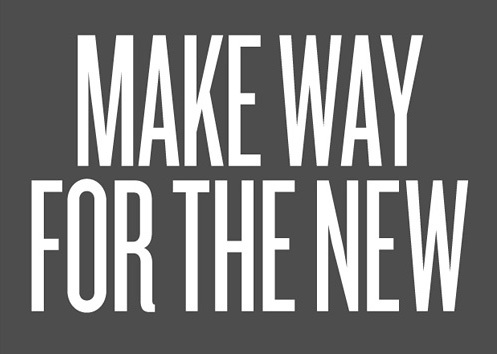 Make way for the new. New, from one of my favorite tumblrs, Modern Hepburn. So it truly has been forever (over a month!) since my last post but I’ve experienced some big changes that have commanded my attention: Left one job, freelanced for two others, and started a new full-time permanent gig. Whew. The last six months in general have been a big period of transition, but I can finally say I found somewhere I’m excited to stay and grow some roots. 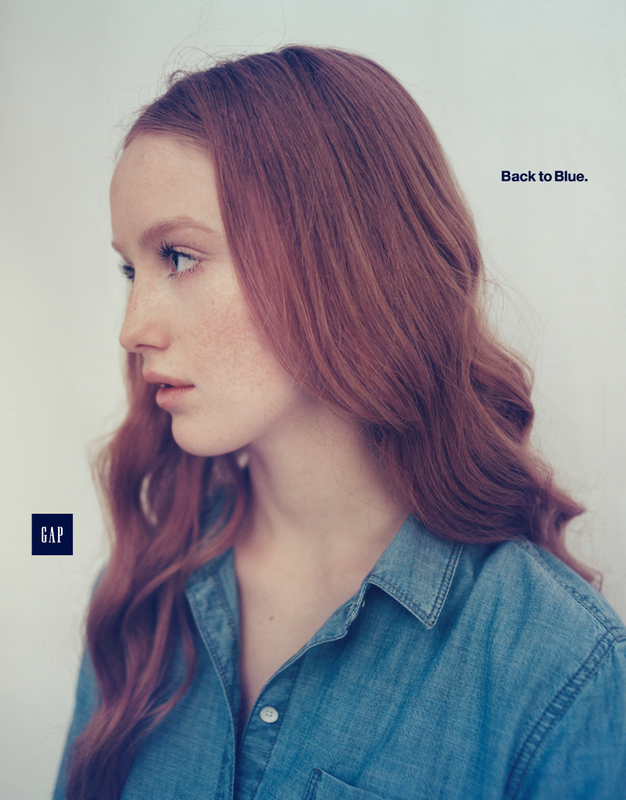 Two weeks ago, I joined Gap Inc. on their global creative team that oversees windows and in-store experience. Gap is a brand that I was obsessed with in middle school and followed ever since. To be here today is a bit unreal, but also very exciting. Go Gap! i did, and it was the most motivating moment in my life. — Georgia Whots, “Doing.” cir. 1933. Anyways, enough of that rant! Now that I’m working at ONE place for the next who knows how long, I want to return to blogging and focusing on my side passions: textile + pattern design, photography, and cool design projects to curate and share. I’ve been spending lots of time on Pinterest, Tumblr, and Instagram lately – so if you’re not following me there, do so and get into it! ps. 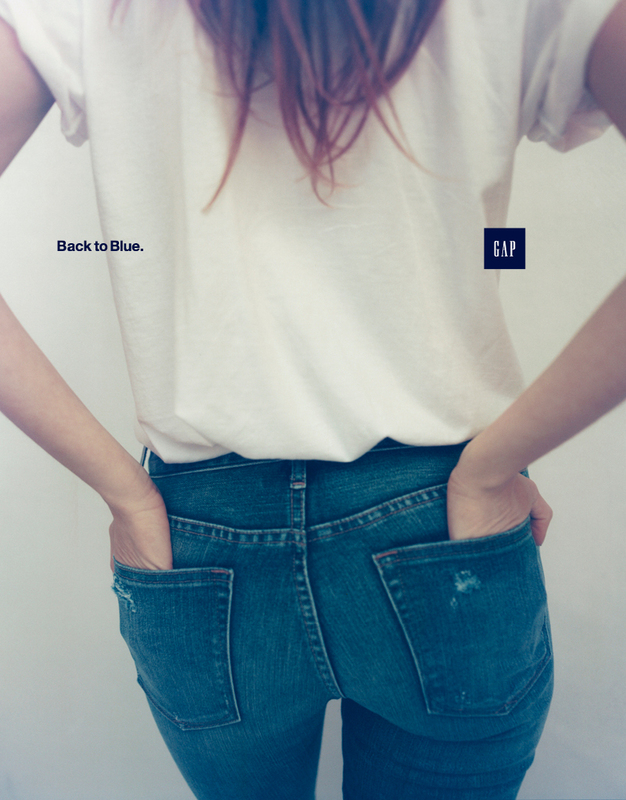 I’m majorly into Gap’s new campaign “Back to Blue,” for many reasons. I love the subtle design – so new and fresh no? You can’t go wrong in anything blue or denim! Follow Gap on tumblr to see more! My work on Typography Served! 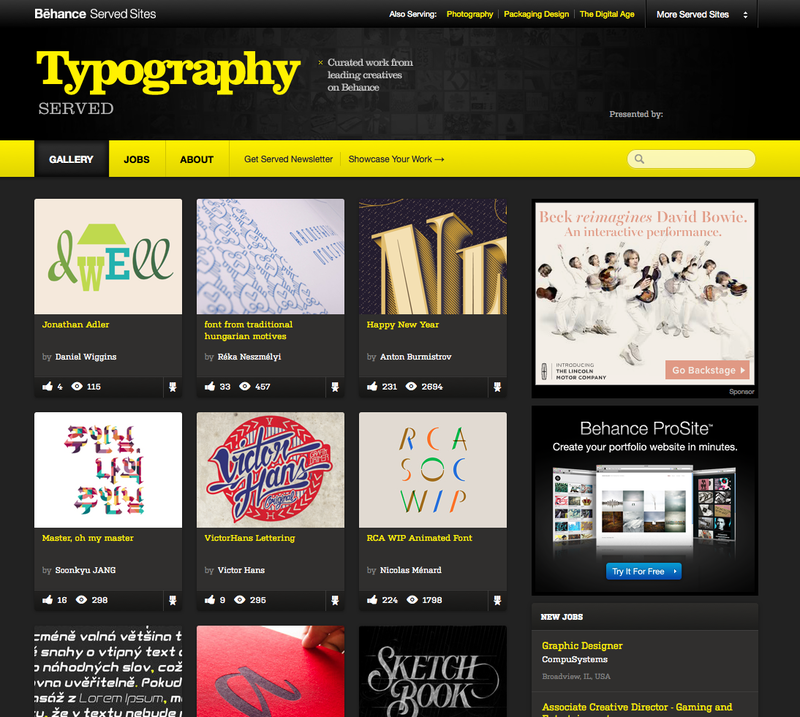 Today I got quite the surprise in my inbox from the folks at Behance. My work for Jonathan Adler is being featured on Typography Served, a site with curated work from leading creatives on Behance. What an honor! Thanks Behance! 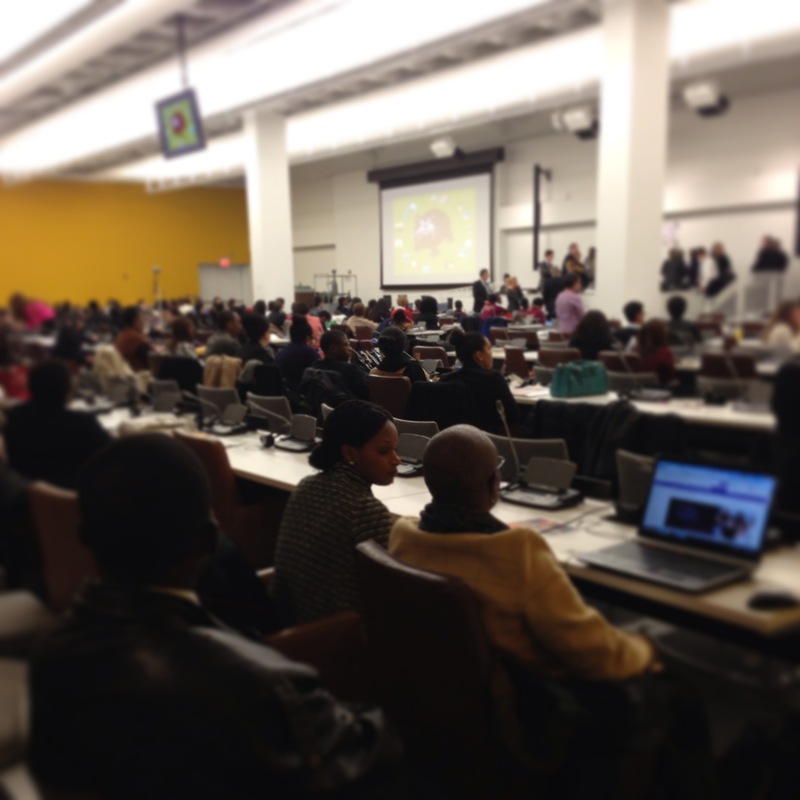 Several weeks ago, I was invited to speak at the United Nations Youth Assembly about my 2010 trip to Australia for the 63rd UN DPI/NGO Conference. I blogged about my experiences in Australia (here), and blogged a lot about this trip inspiring my Pratt MFA thesis. So when I was asked to speak to youth about my experiences at the UN, I gladly accepted! I was nervous speaking to experts in the field about my outside experience in Australia several years earlier but also thought my outsider perspective might resonate with other youth people at the conference. I remember attending a conference like that three years ago (read here) and wanting to connect with the speakers but never really got there. 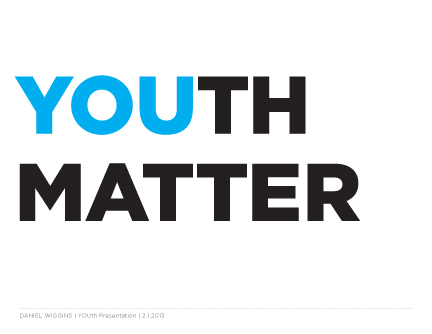 With this in mind, I focused my presentation on the importance of youth and why design matters. 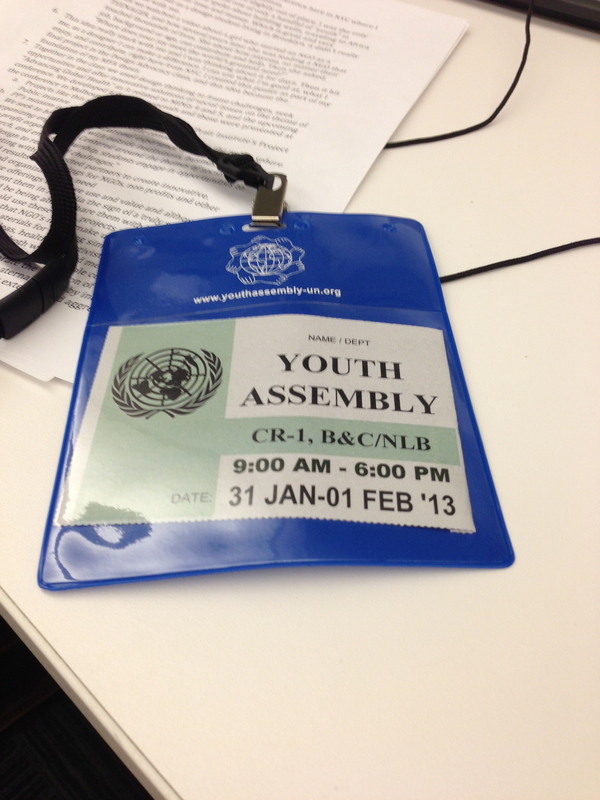 My ID tag, officially welcoming me into the United Nations! 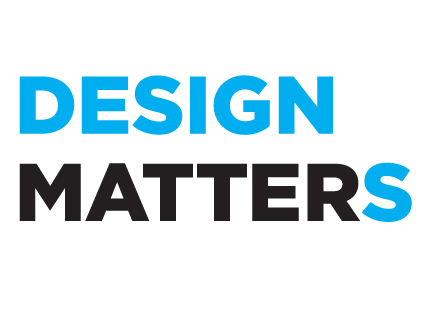 One of the biggest points I made is the amazing potential designers and nonprofits have when they collaborate together. Collaborations between unexpected partners often lead to unexpected and surprising results. 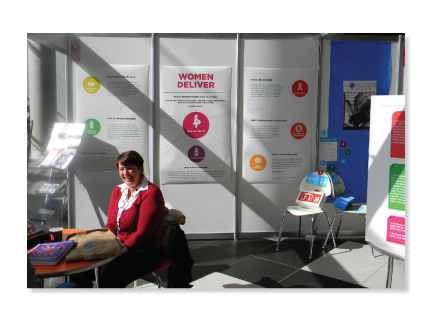 One prime example is my experience as a graphic designer at a UN Conference centered on Public Health. Attending this conference sparked my interest in the subject of joy and using one’s skills and abilities to create change in the world. 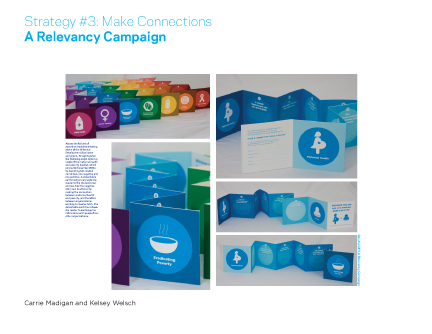 Many of the projects we created in the class at Pratt strove to do just that. 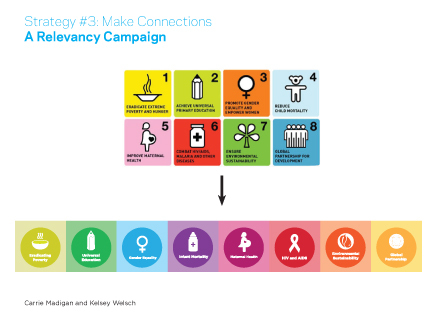 Kelsey Welsch redesigned the MDGs icons and created an amazing project linking Material Health to all the other MDGs. The MDG Youth village created by myself and students at Fordham University. 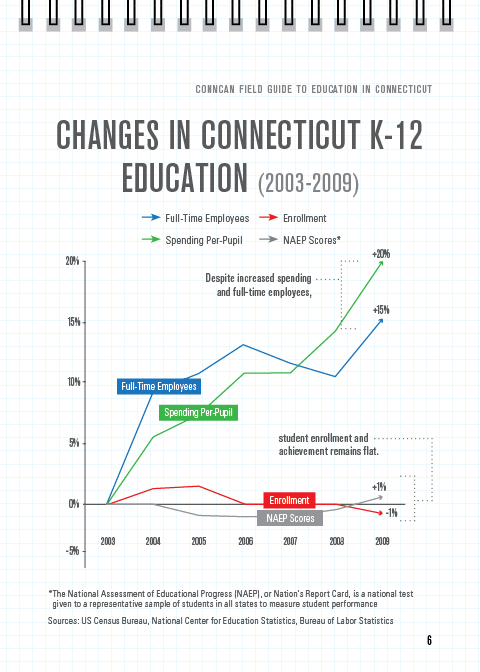 In closing, I wanted to bring focus from design back to YOUth, and end on an aspirational note. On the last day of the Australia conference, Patrick Ip (my roommate for the week) spoke about “What and Why” in regards to youth. 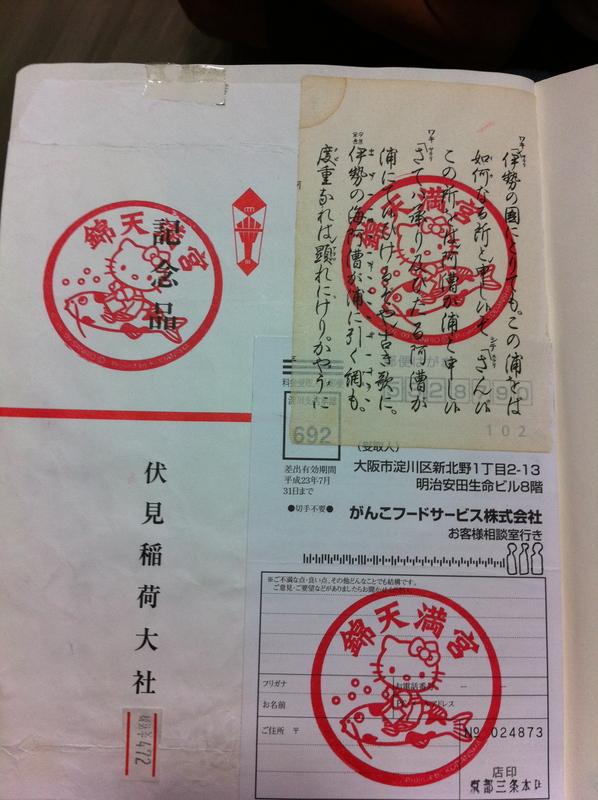 He said, “Often youth are defined by WHAT we are; teacher, student, doctor, etc … not WHY we do it. 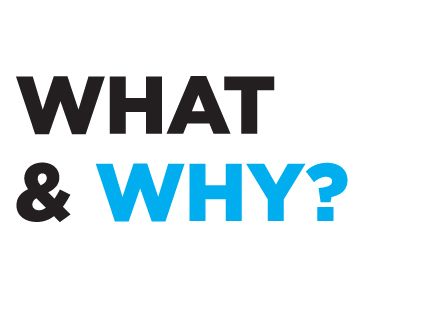 Many of us, no matter WHAT we do, want to help, and it’s important to focus on WHY. For when we define ourselves by WHAT we do, we limit what we are capable of doing. 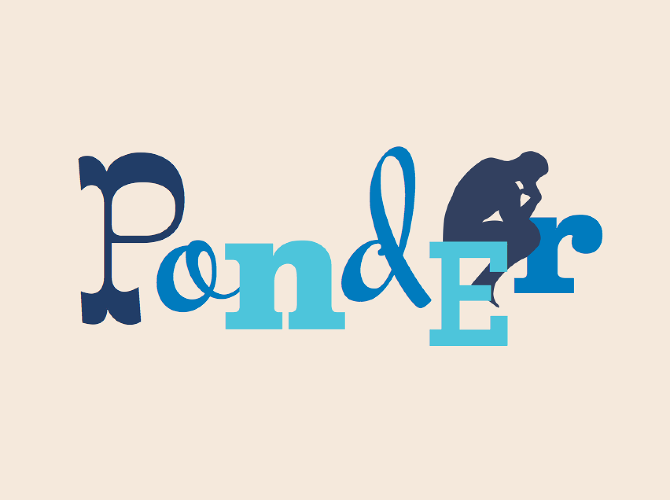 But when we define the WHY, the possibilities are endless.” This really spoke to me on the last day of the conference and is still something I think about today. If there was one thing people took from away my speech, I hoped it would be Patrick’s great words. A packed house of students from all over the world. 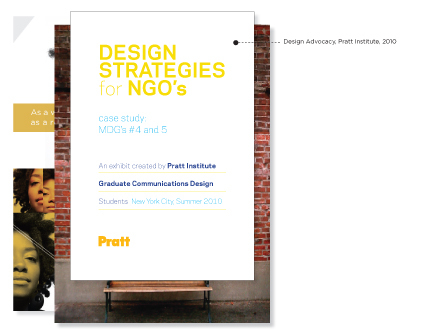 If you want to learn more about designers and nonprofits/NGOs partnering together, check out Pratt’s Project Public initiative. And remember, if you focus on the WHY in life, and not come from a place of WHAT, any door can be open to you no matter what you do in life. Cheers! What I’ve been up to ..
It’s been a few weeks since my last post so I thought now would be a great time to update you guys on my freelance projects from the last few months. While things have been busier than ever at my day job (designing for Moroccanoil), I’ve been doing more and more freelance the last few months. 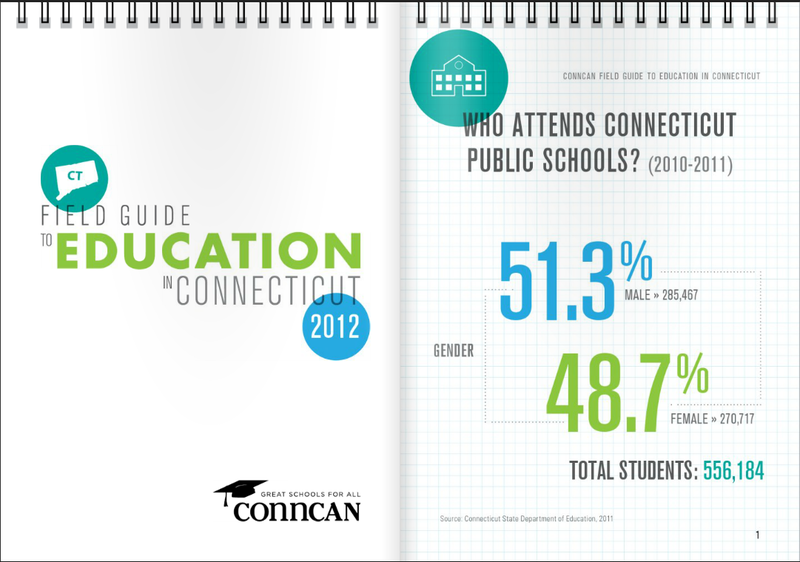 One of the groups I most enjoy working with is ConnCAN, an education non-profiled based in New Haven, CT. 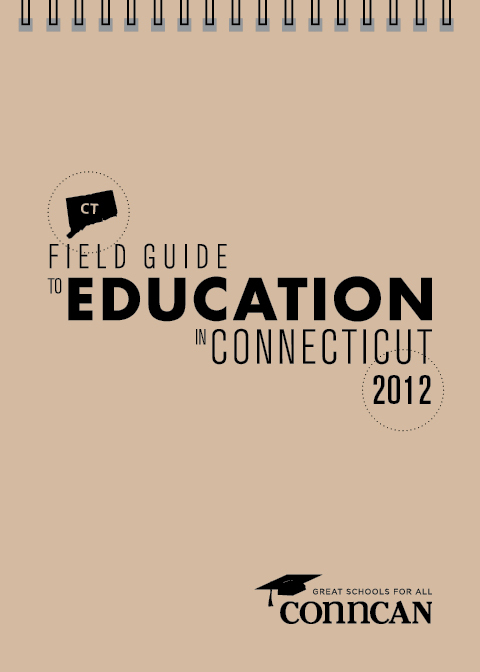 I was approached by ConnCAN last spring to work on a Field Guide (pictured above) highlighting the state of education in Connecticut. We were inspired by the graphic look of the Field Notes series of products, so we applied this theme to ConnCAN’s Field Guide. 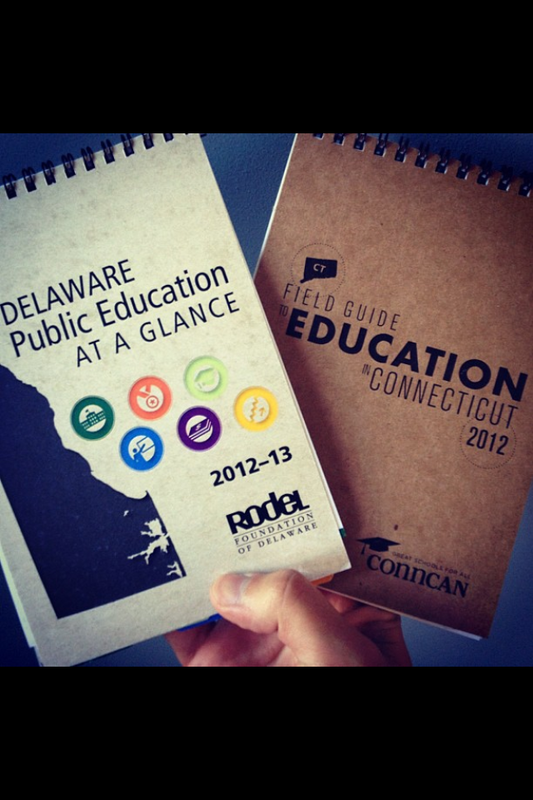 The Field Guide is filled with lots of charts and tables all designed to match the “Field Notes” theme. I designed a set of icons that appear on each page to look like field guide badges. The look of this report was so well-recieved, that one of Deleware’s non-profit groups designed their own guide/report inspried by my design. 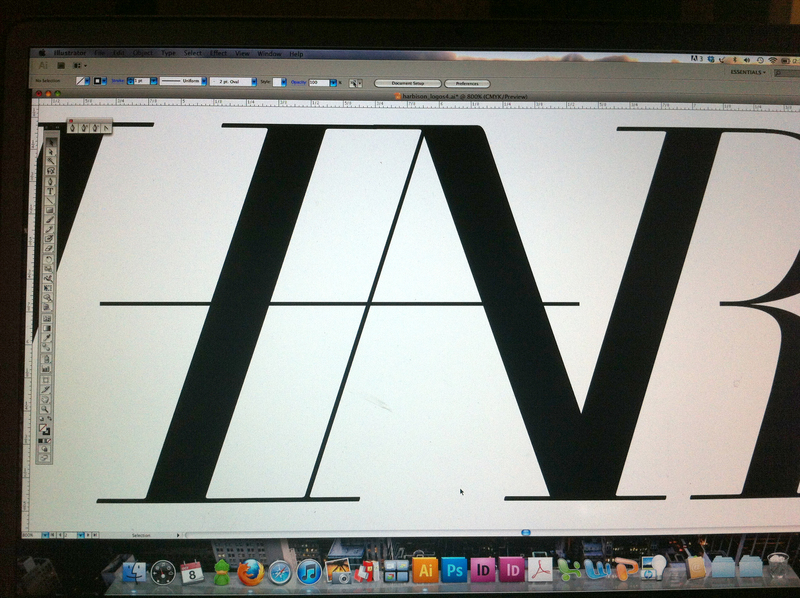 Another fun project I’ve been working on is a logo/branding project for a NYC-based fashion designer. After years of working for some of the biggest brands in the business, he’s decided to make his impact on the fashion world with his own label. I’m going to wait to show you the final product once his site launches, but I think some of the process/behind the scenes screen grabs are particularly beautiful. I don’t actually design that many true “logos,” nor do I do that much custom lettering, but for this project I had the opportunity to do both. Custom “A” and “R” pictured above. 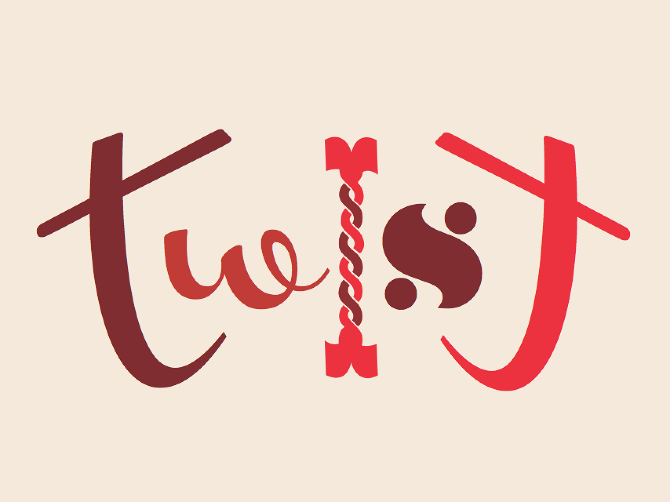 Playing with letterforms – beautiful no? 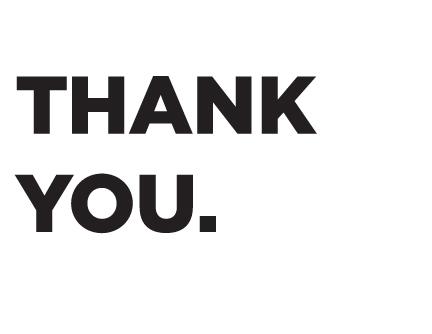 One last shoutout to all the designers at Appalachian State University! 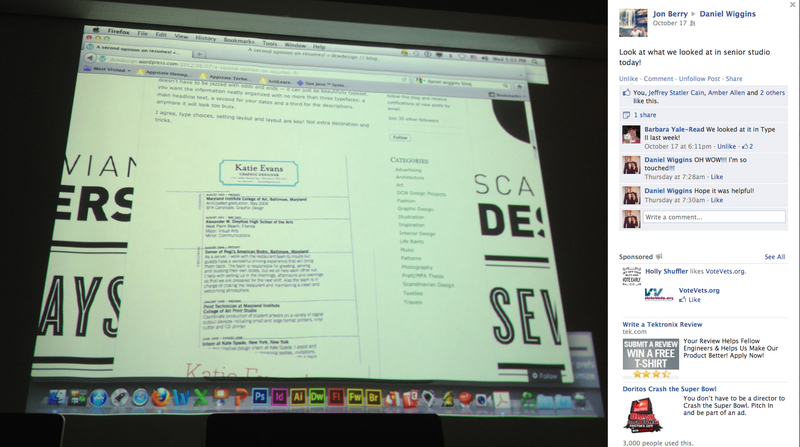 I was told last week that my blog has been showed in studio classes for my thoughts on resume/portfolio design. It’s nice to come full circle, just a few short years ago I was in those same classes myself. So sending loves of love to ASU! 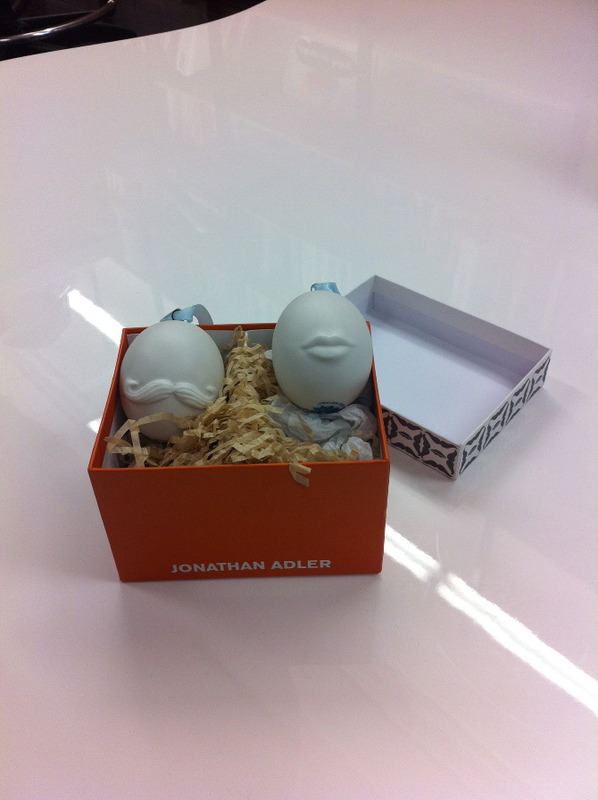 As most of you know, last spring I was given the extraordinary opportunity to intern for the one and only Jonathan Adler, purveyor of all things happy and chic. 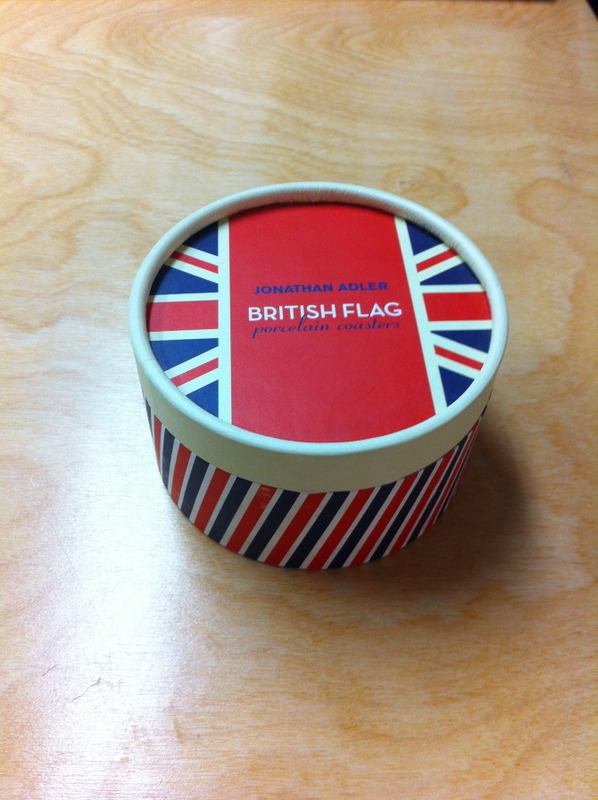 Now is an exciting time because most of the things I’ve designed for JA are finally hitting stores and online. 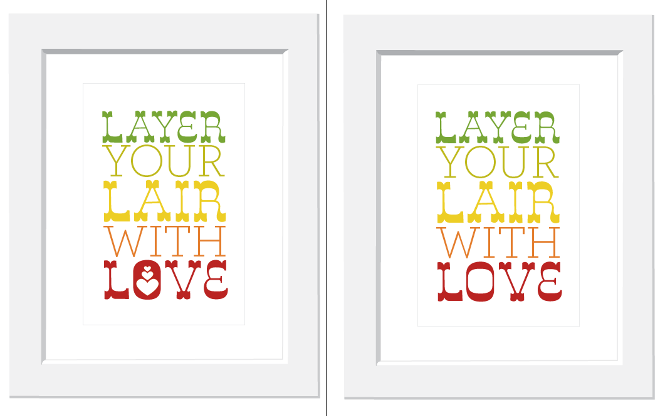 One of the items I’m most excited about is the Peace & Love coasters I designed. 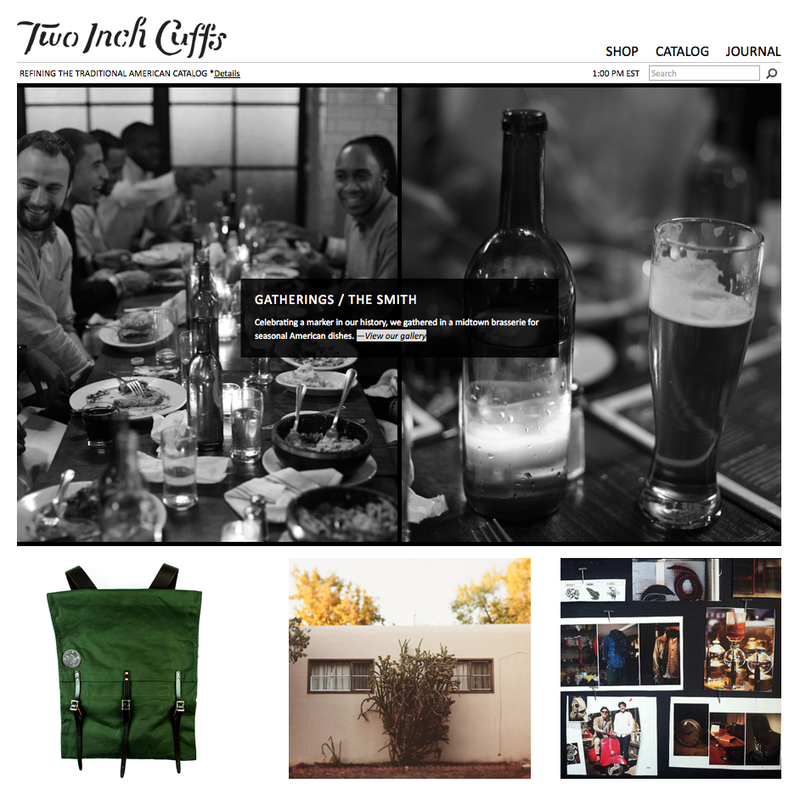 For this project, I had just a few hours to design two sets of coasters for Saks Off 5th. One design was to use a British Flag motif while the other should use art from the existing Peace & Love pillows. To make a long story short, Jonathan liked the coasters above so much, he decided to sell them in our stores and I created another simplified version of the Peave & Love artwork for Saks Off 5th. 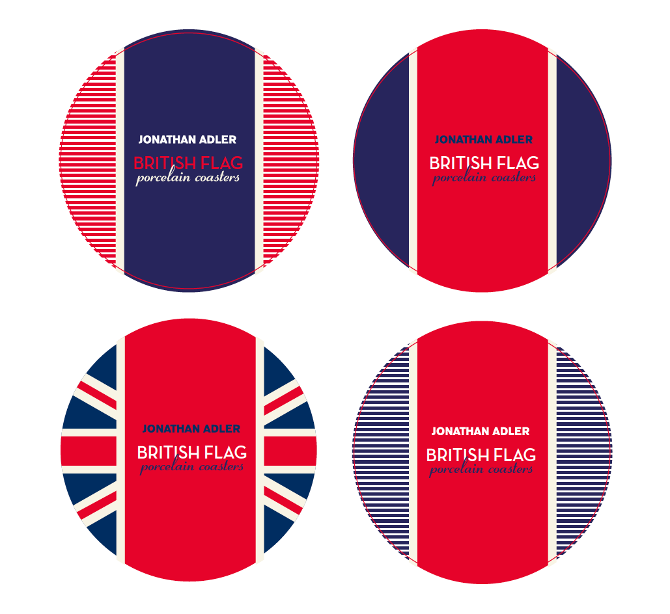 I designed 4 different patterns using British Flag design motifs. I really likes the ones with the strips – very nautical right? 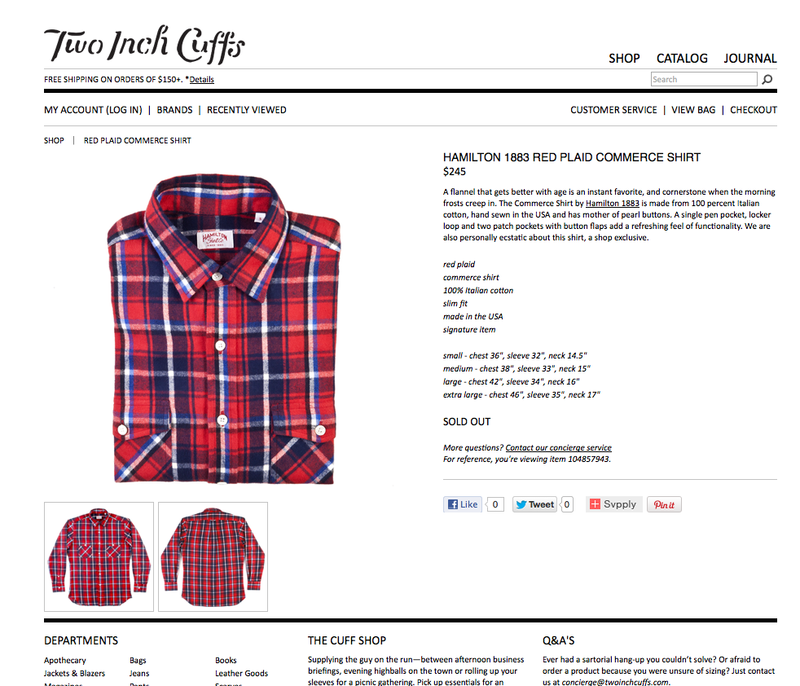 Final Design – available now at Saks Off 5th !! 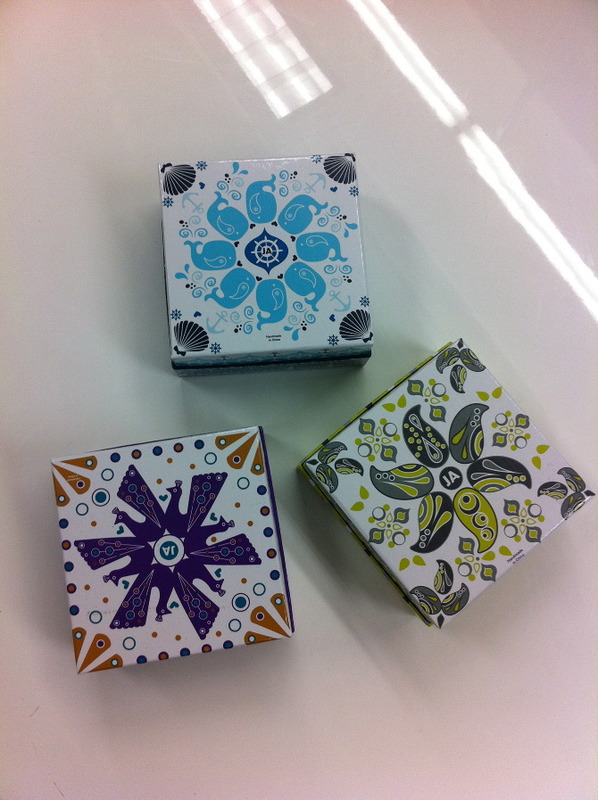 Another big project was the packaging for the 2011 holiday ornaments. In the middle of March we designed these. Who knew Christmas came in the spring? Mr + Mrs. Muse ornament packaging. 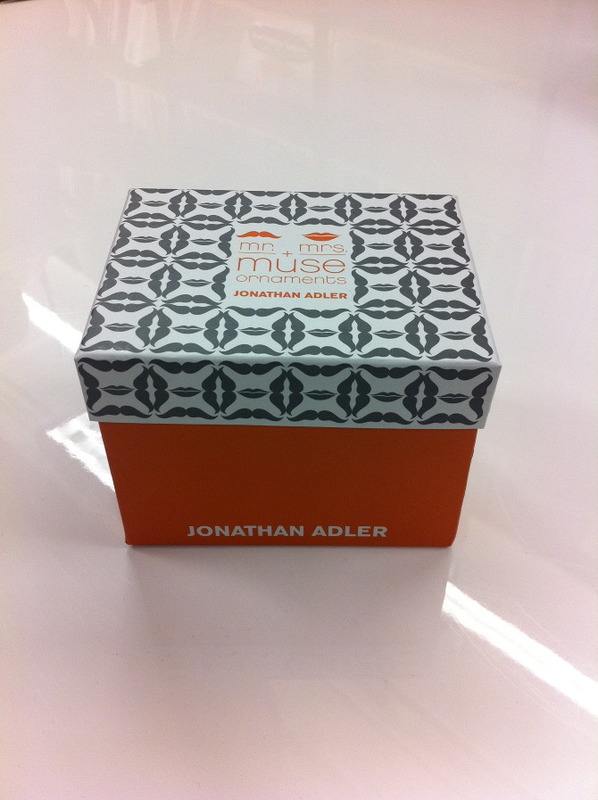 I created the pattern on the box, which is made of the iconic lips and mustache used in the Jonathan Adler Muse collection. Another project that was super exciting is this line of typographic needlepoint pillows we designed for an upcoming Jonathan Adler book. 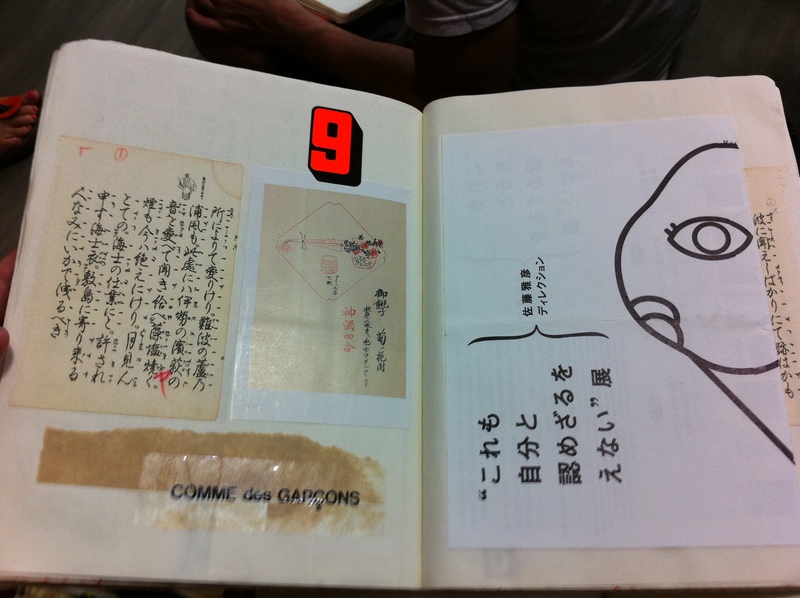 The chapters of the book are divided into the following sections: dwell, embrace, explore, twist, and ponder. 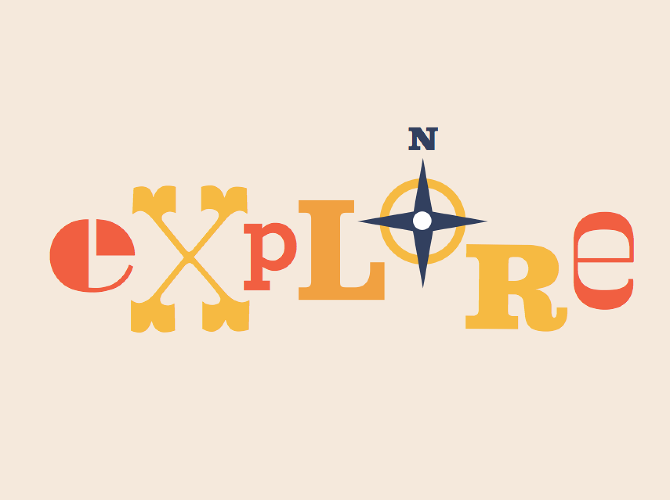 I love to play around with type, so this was the perfect project for me. I had the idea to limit each pillow to a few typefaces and colors. 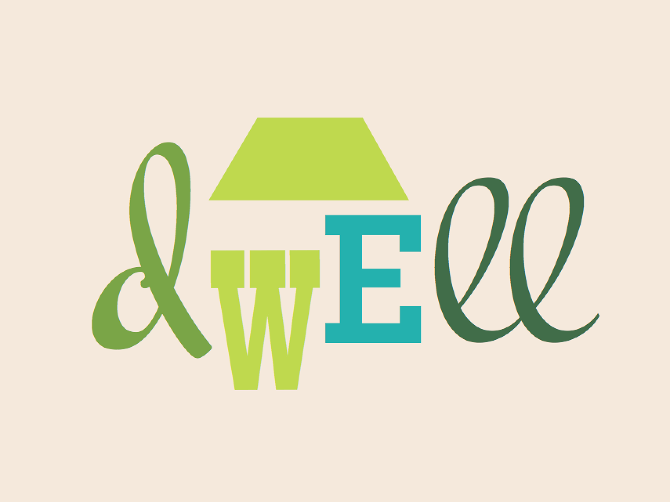 One pillow would have type in shades of green (dwell, see above), another red (twist) and another blue (ponder). 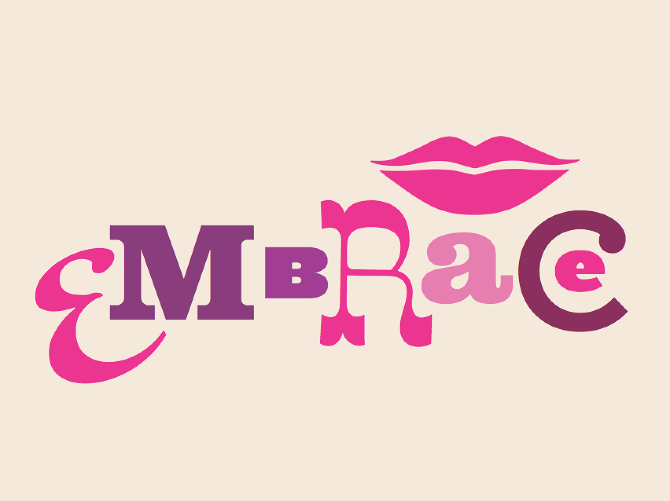 One of the things I LOVED about working for Jonathan Adler was the ability to work on fun projects like this with crazy typefaces. In the design work I do for most clients, I’d never dream of using these typefaces, but somehow all together they’re fun and chic. 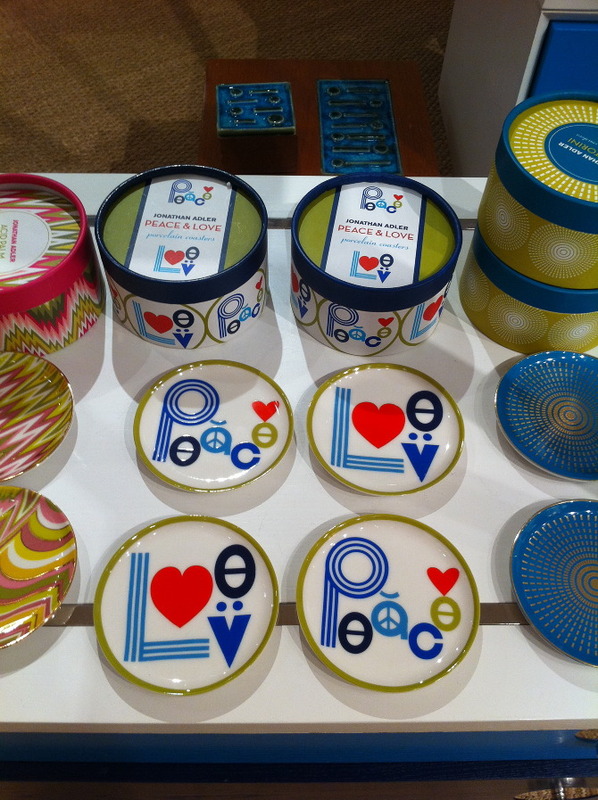 Something about this style really works for Jonathan Adler and isn’t seen anywhere else. 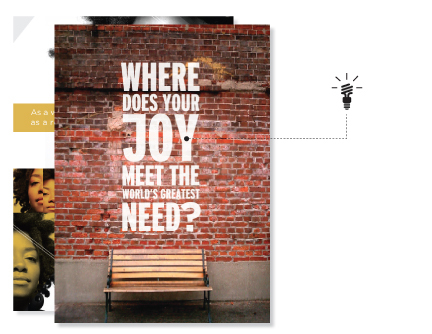 One last project I was super excited about was a line or prints JA was developing for a big picture frame & art company. I’m not sure what happened to this project, but I spend several days coming up with really cool type prints based on Jonathan Adler’s “Alderisms” or words and phrases JA uses a lot in their stores. Sadly this is the only one I have a copy of. How cute would this be in your apartment right? Click image above to flip through entire book! But this isn’t a post about drawing per say. It’s more a post about process and the documentation of mine during my trip. 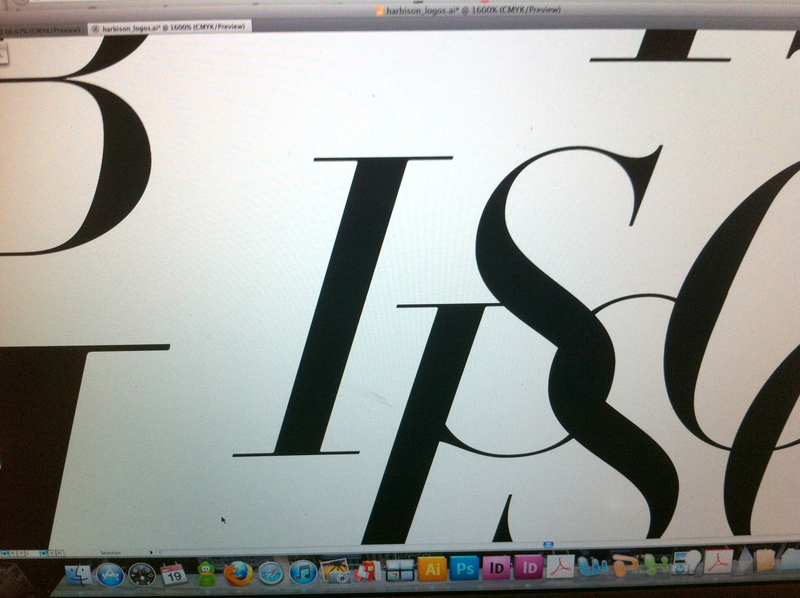 One of the greatest hallmarks of Scandinavian Design is process. We were told this again and again. We were encouraged to experiment, make, sketch, paint and take pictures. Many of our experiments were trail and error but together culminated in our final textile designs. In this course, the process was more important than the final product. 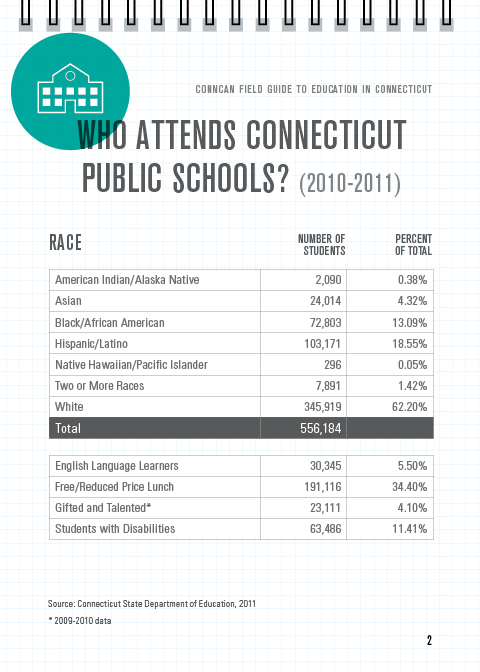 This is in stalk contrast to design education in the US. I can say this honestly because there’s many times I’ve done a project in a night or two days, totally disregarding process. While this helps me and other designers get by, we’re not really learning anything. We often resort to ideas we already had and that process gets exhausting. We’re left with uninspired work and no new ideas. That’s why process is so important. After this trip I feel more full with ideas for design projects than ever before. A lot of this I credit to the first mentioned sketchbooks! I loved the shades of greens and brown I saw on buildings in Helsinki, Finland. 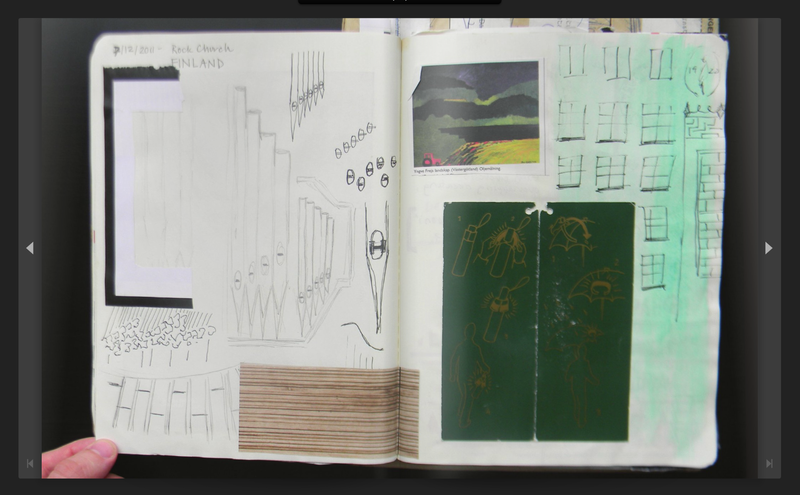 The organ pipes appear many times in my sketchbook – I think they’d make a great pattern so that’s something I hope to work with later on. A study of black & white. This is a free giveaway we were given at Valilla Interior. I loved the colors and graphic patterns of their textiles. Instead of keeping this brochure in a folder I decided to bite the bullet, cut it up and glue it into my book. Now all my inspiration is together and in context with similar inspiration. 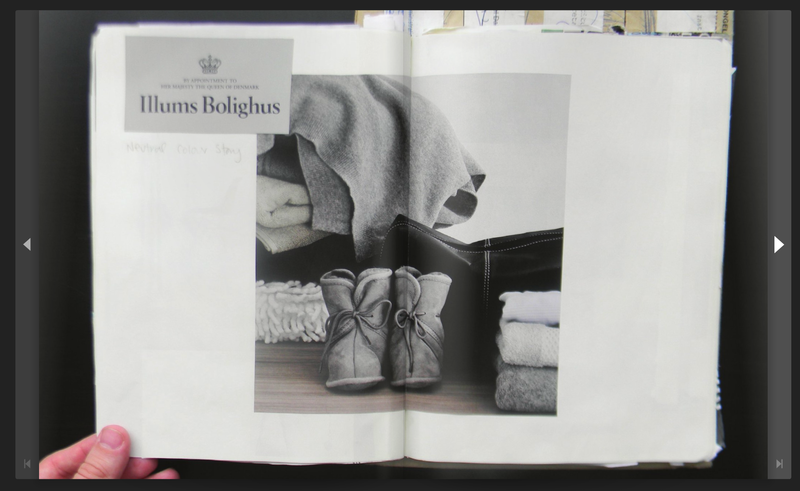 Illums Bolighus is a BEAUTIFUL store in Denmark and Sweden. It’s part design store, part kitchen, bath, home, and clothing department store. Basically they have everything you need to make your home beautiful. They also have beautiful ads like this one above. In love with the shades of grays here. 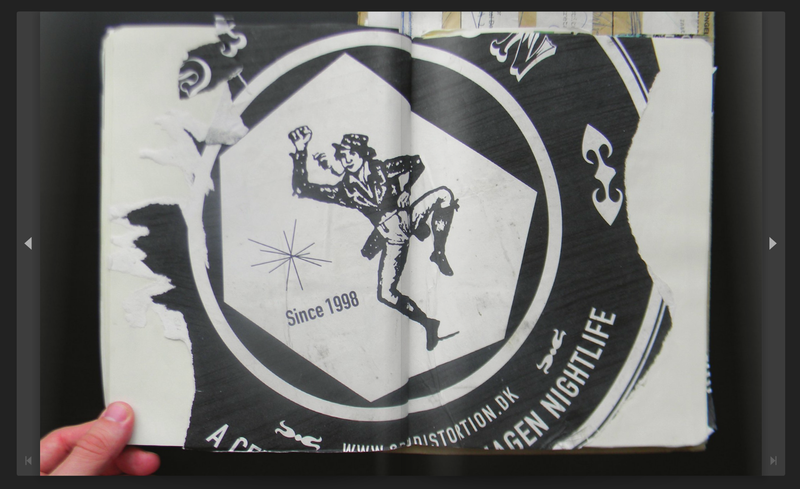 I ripped this down from the street in Copenhagen. Love the ripped edges too – gives it some character. Don’t be afraid to leave edges unfinished and rough, you can use it to create interest in your sketchbook or design work later on. In this page I ripped up a Marrimeko ad to try and create something new. The opposite page is one of the early circles exercises I drew in the process of creating my final print. 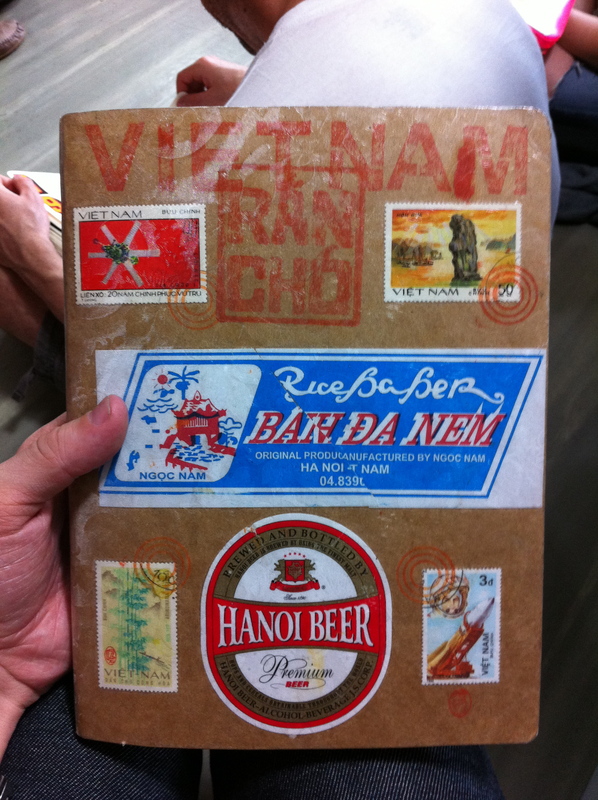 Here’s an example of printed things I found during my trip. I saved everything and glued them into this book. Now its all in one place anytime I need to look at it. To see the entire sketchbook, go here! 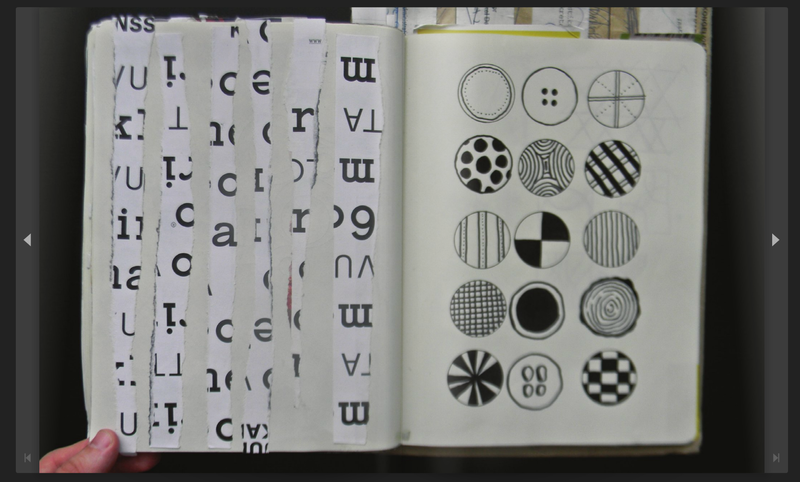 Now when I look back at this book, I can isolate type treatments, color combinations, textures, techniques, and general inspiration for new projects. 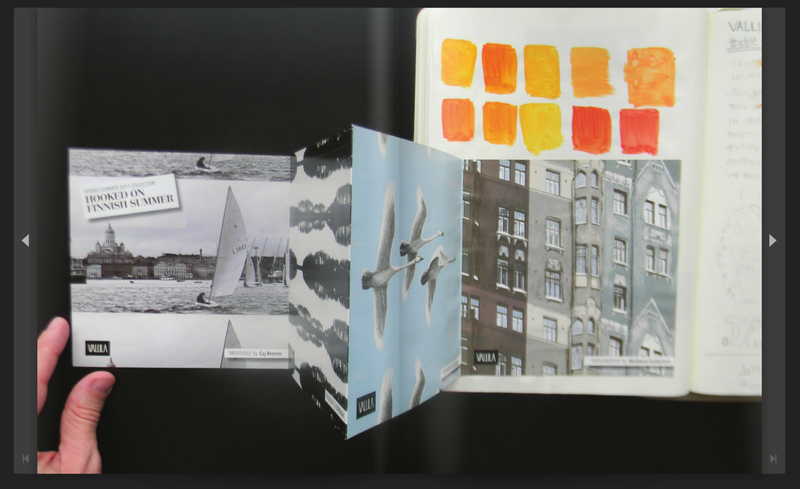 I tried to think of each spread as a compositions by mixed unrelated materials together creating new juxtapositions. Now I can’t take all the credit for collecting and documenting design in this style. All the credit goes to one of our instructors, Helle Vibeke Jensen. We visited her studio early in our trip and that day had a profound effect on everyone in the program. 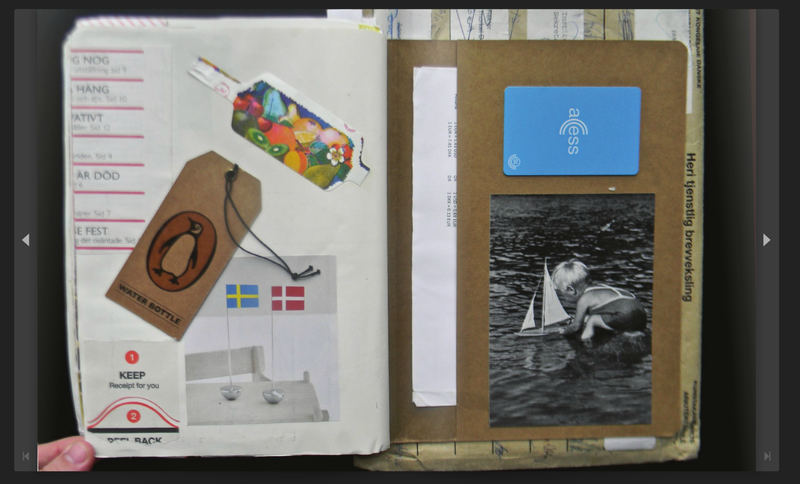 Helle Vibeke has been keeping sketchbooks in this manner for YEARS. 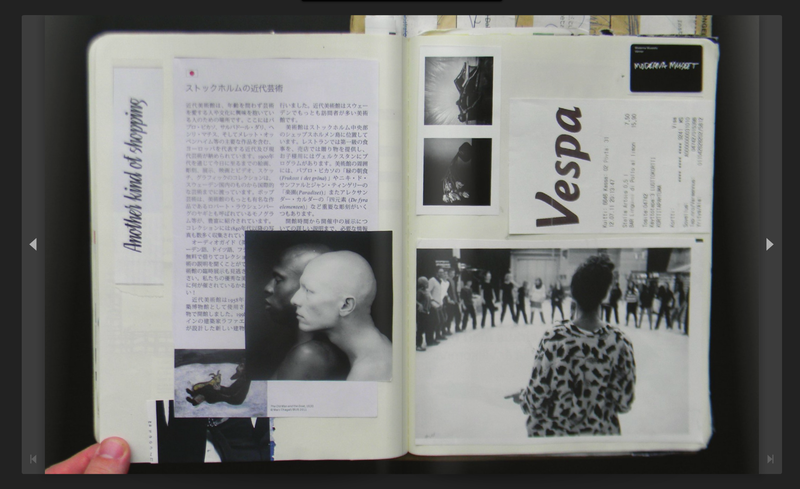 Her studio is a library of cataloged inspiration from all over the world. 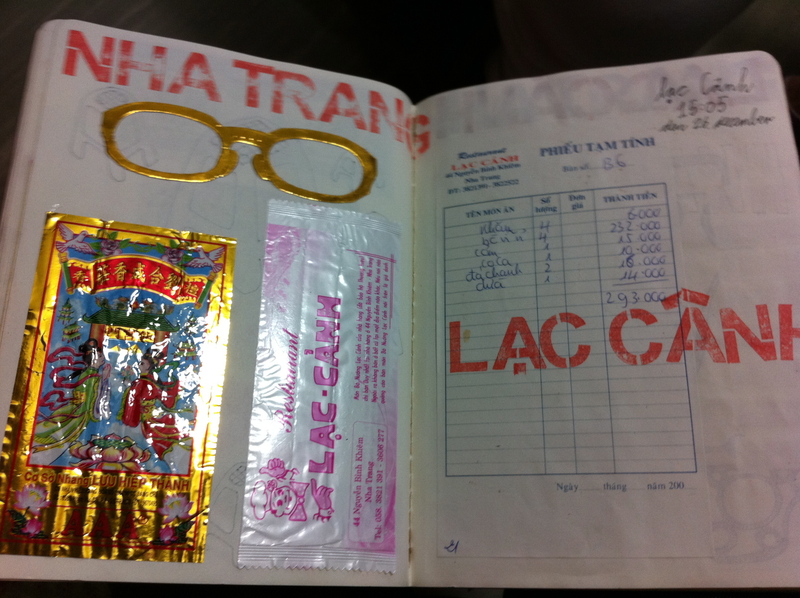 Each time she goes on a trip, she buys a new Moleskine and begins collecting scraps and drawing. 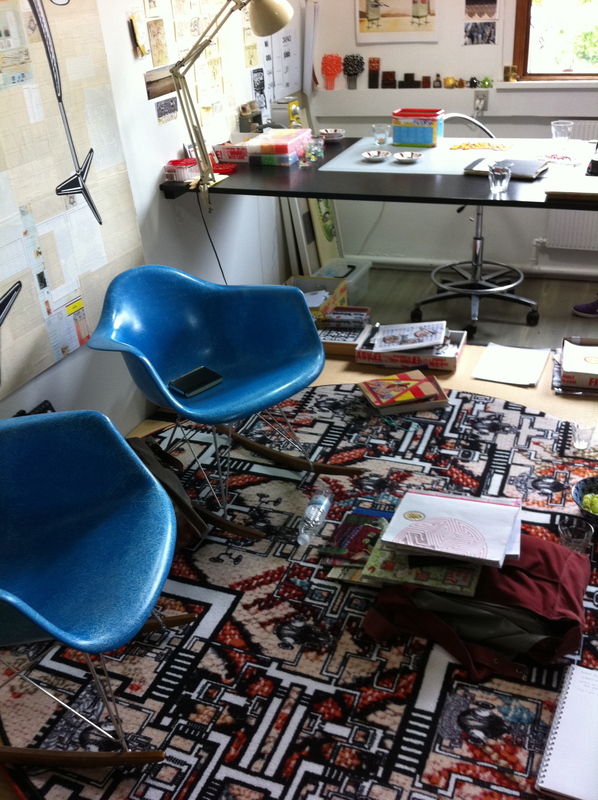 Here’s some photos from our studio visit. Above: Her studio. Loved these blue chairs. Makes me dream for my own studio one day. 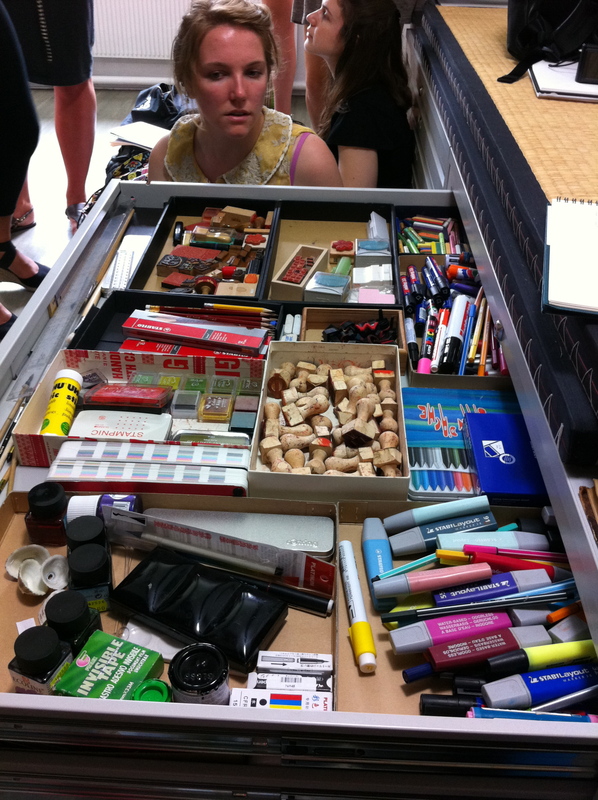 One of her many supply and inspiration drawers. So much fun stuff to play with. 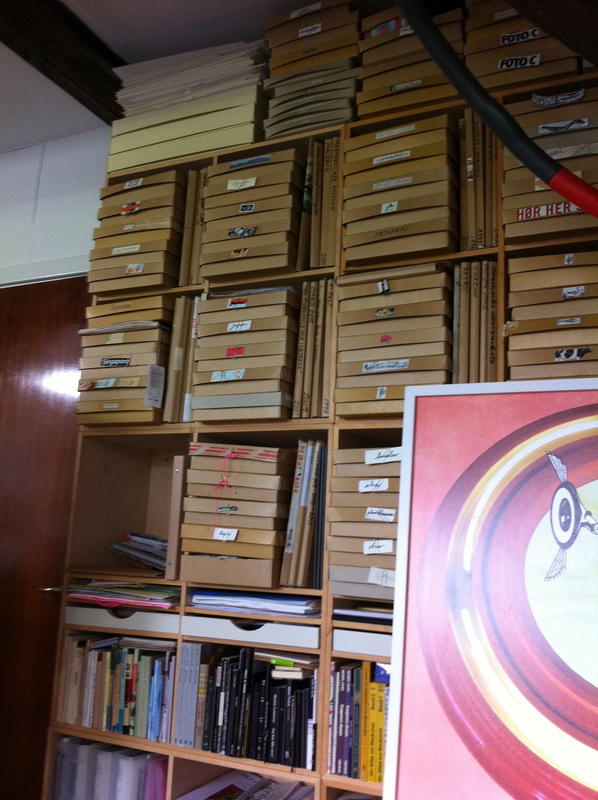 Helle Vibeke’s library, full of her sketchbooks and books she’s illustrated and designed. To see more of her work, check out her website here.